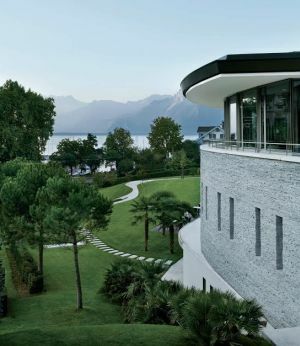 Set against the stunning backdrop of Lac Leman, Montreux (Switzerland), and less than an hour’s drive from Geneva Airport, Clinique La Prairie (CLP) is one of the world’s leading medical spas. The air is so clean you can feel yourself detoxing as you walk along the lake, but it is CLP that has built up an enviable reputation offering cutting edge programmes dedicated to wellness, proven aging solutions and rejuvenation. First and foremost it is a medical spa, distinguishing itself from a typical luxury spa hotel, with a medical centre supported by a team of 50 clinicians, each one expert in a range of conditions. “We are not a hotel, we are a results driven clinic where health is at the heart of everything we do,” explains Vincent Steinmann, Marketing manager. Clientele come from over the world, but it was notably Russian and Asian visitors getting settled when we checked in. There are regular scheduled services from Beijing into Geneva with Air China, while Etihad offer services from Shanghai via the Middle East and its new partner Etihad Regional. Uber HNWIs (super high-net-worth individuals) fly in regularly with their private jets too. Gama Aviation, one business charter resident at Geneva Airport, for example, can call on a number of short and long range jets from its managed fleet to serve UK and longer haul markets. CLP focuses on preventative medicine and encourages its guests to achieve wellness through a holistic approach to diet, exercise and attitude. (Every client is given a full personal assessment on arrival and given an individual programme for their particular needs.) Management recently undertook a five million Swiss Franc refurbishment of its spa, formally unveiled in January this year. It offers a whole new space dedicated to wellbeing where hot, cold, water, ice, steam and dry all combine in harmony. The treatment rooms are colour coded too – blue for face treatments; green for the body and orange for massages. And don’t think this is just for the girls. A full update of the men’s dressing rooms brought in a more masculine look with strong red and black lines and there is a comprehensive treatment menu for male clientele. The 50 or so treatments now combine to form individual programmes or single day spa journeys. 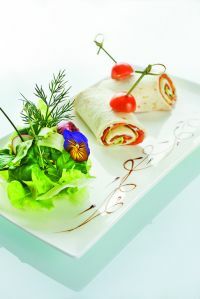 Medical it may be – in crisp white, but its updated spa is far from sterile. Subtle textured walls, natural materials and decorative contrast create a serene, luxurious environment. Elegant wall hangings act as sound absorbers, contemporary glass fronted saunas and Turkish baths, along with an inviting jade green whirlpool and generous sized indoor swimming pool sit adjacent to the relaxation room. It offers curved recliners with soft sheepskin blankets and pre-loaded iPad relaxation music under soft lighting. Its signature Revitalisation treatment remains the most popular programme whilst the Rejuvenation treatment, a Rebalancing programme and a fully comprehensive weight loss programme are all favourites of the clinic’s international clientele. We were fortunate enough to enjoy a super-rejuvenation day, a mix of facial and body treatments that nourish, hydrate and reshape the skin. Hundreds of tiny gold heated electrodes stimulate the renewal of collagen in the skin as oxygen pushes exotic serum ingredients deep into the facial cells. A massage follows while a collagen mask stimulates circulation, restores elasticity and resculpts the face. The process takes about three hours – leaving our faces softer than the sheepskin in the relaxation room. The body is also worked on using a new contouring radio frequency treatment to tone and tighten the skin. The three-hour treatment involves five round bulbous electric nodes which pass increasing levels of radio frequency over the limbs. An optimal skin heat is required for the frequency to be its most effective, just staying on the right side of bearable; the sensation is that of hundreds of little electric shocks passing over the body. It’s unusual and takes some getting used to but is followed by a cooling wrap. A new treatment, Pressotherapy involves wearing a pair of high wasted trousers – just like a space suit. The individual chambers forming the trousers legs are inflated with air which then rhythmically moves to massage the limbs. It’s a weird sensation but the results are incredible. Legs and the whole body emerge lighter and truly refreshed. Anyone wanting to make a real difference should engage CLP technology on a hospitality stand at an industry air show we thought! The food offered during our stay was delicious – organic seasonal dishes with a strong emphasis on ingredient provenance ensure guests never leave the table hungry. A contemporary, informal café contrasts with the elegantly styled dining room and offers long term visitors an opportunity to mix up their dining options. Complementing the more formal restaurant is a poolside bar serving light refreshments and the most amazing smoothies – designed to detox, anti-age or energise. (We learnt so much from this menu and the Nutra Bullet now installed in the office is a nod to the benefits of a CLP stay).